Valkyria Chronicles became one of the most inspiring and engaging strategy RPGs in recent years when it was released on the PlayStation 3 back in 2008. 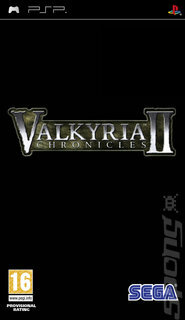 SEGA has given it another crack with Valkyria Chronicles II, on the PlayStation Portable. Events take place two years after the conclusion of the PS3 original, where the East Europan Empire's leader, Maximillian, was defeated by a ragtag group of Gallian soldiers. Today, a group of young cadets in the Gallian Military Academy find themselves in another fierce war, brought about when a Gallian Revolution Army stages a coup and begins a civil conflict. As you lead the Academy soldiers to victory, you learn more about each character's reasons for signing up and follow their comradeships in this troubled time of war. The gameplay remains largely unchanged from the original Valkyria Chronicles, and this is a good thing: battles are split into turns, during which each player must spend battle tags to move their soldiers around a 3D environment strategically. This sequel on the PSP uses a redesigned "BLiTZ" battle system to allow for real-time controls and combat, as has the "CANVAS" engine that delicately shows each scene and scenario in a way that seems like you're playing in a moving watercolour painting. Over 20 new environments can be played and will offer hundreds of different missions for players to accomplish.